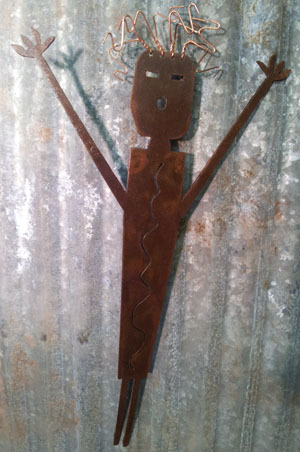 This Hanging Mosquito is plasma cut out of steel, welded together, lovingly bent into its Mosquitoie shape, then dipped in a super secret Rust Juice. PLEASE NOTE! These have a HAND APPLIED PATINA and each one is UNIQUE. I can make no guaranties that you will get one that is the exact same as the one pictured. If you have any questions, please email me before ordering. Mosquito’s are found almost everywhere and are a giant pain. 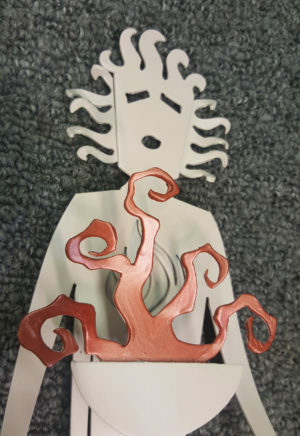 I made this little guy out of a sense of whimsy AND he doesn’t bite! 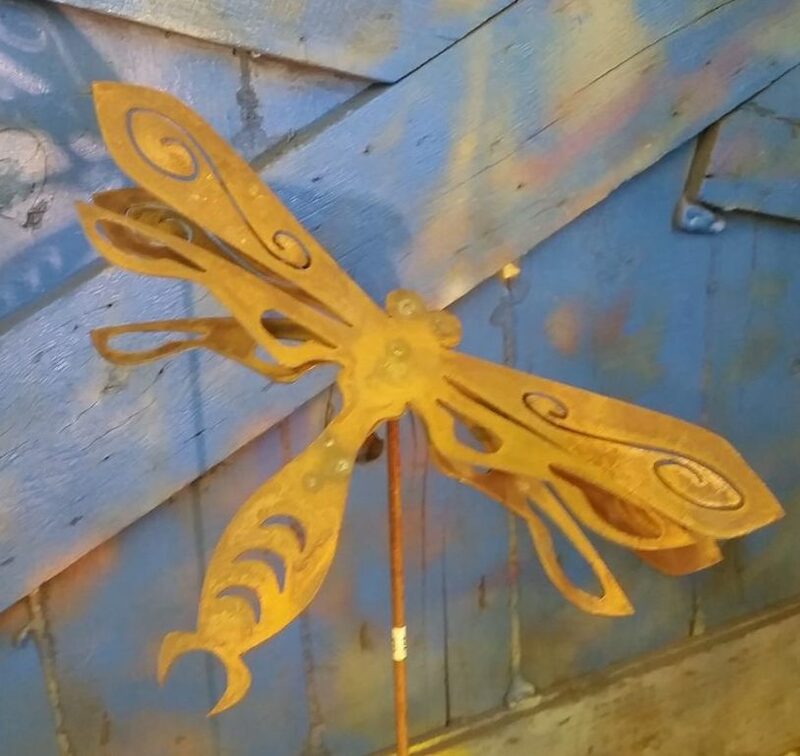 This Hanging Mosquito is plasma cut out of steel, welded together, lovingly bent into its Mosquitoie shape, then dipped in a super secret Rust Juice. Finally, several coats of Lacquer to seal in the goodness. Hanger not included. PLEASE NOTE! These have a HAND APPLIED PATINA and each one is UNIQUE. I can make no guaranties that you will get one that is the exact same as the one pictured. If you have any questions, please email me before ordering. To stay up to date on Sleeping Dragon Studios happenings, sign up for my newsletter and be sure to LIKE Sleeping Dragon Studios on Facebook. EVERYTHING at Sleeping Dragon Studios is designed and made in Saint Croix Falls, Wisconsin. by David N. DeMattia! 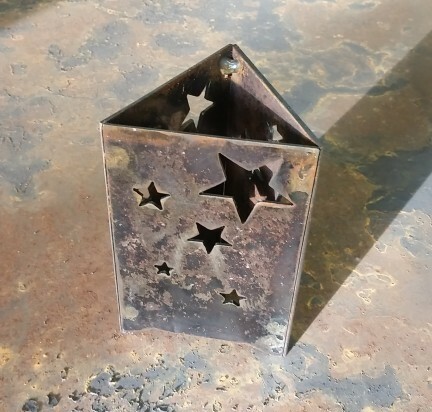 This Mini Star luminarie is plasma cut out of 14 gauge hot rolled steel, welded together, then soaked in a special super secret “Rusty Juice” for a unique patina. Several coats of Lacquer are applied to seal in the freshness! This wall hanging panel would make a lovely addition to your indoor and outdoor spaces that would create a unique and Interesting focal point! 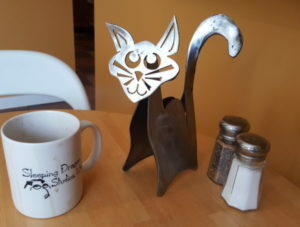 Wide Eyed Penny Kitty Sculpture is modeled after my little black cat, Penny. 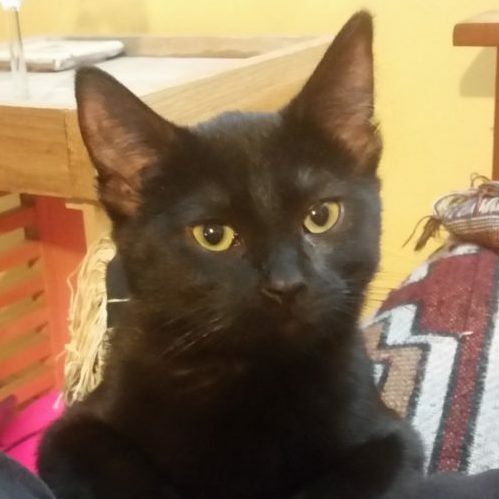 (There is a picture of her in the picture descriptions) She is a curious, friendly and silly cat. I tried to capture her likeness in this sculpture. 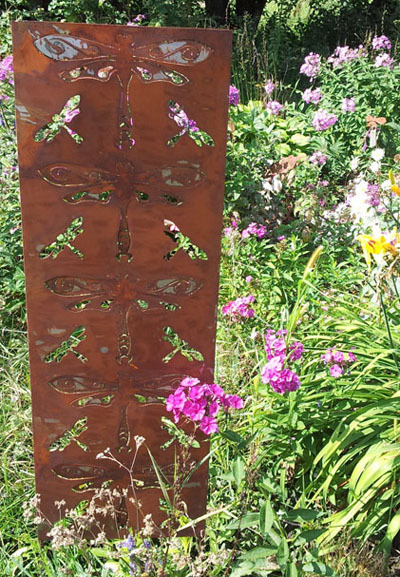 This naturally rust colored trellis would look good in any garden or planter. Rust does what it wants, so your panel will look different. Panel is 20″ Wide x 45″ Tall x 16 gauge with 1/2″ rod- 16 lbs. IN ancient times, people considered fire one of the basic elements of the universe, along with water, air, and earth. Fire can be a comforting thing as well as a source of heat and light. Fire can also be dangerous and deadly, racing and leaping like a living thing to consume all in its path.In mythology, fire appears both as a creative, cleansing force and as a destructive, punishing one.People in all parts of the world tell myths about fire. Numerous stories explain how people first acquired fire, either through their own daring or as a gift from an animal, god, or hero. Plasma cut, cold rolled steel. 12″ Long x 3″ Wide. 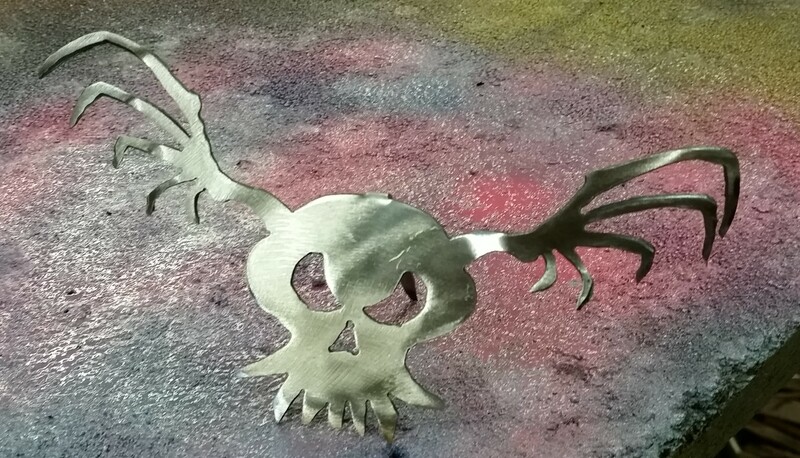 The Serious Flying Skull Sculpture are plasma cut out of steel, hand bent into it’s shape. Large Double Wing Dragonfly on a four foot Stick.